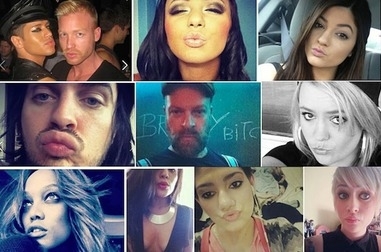 The Selfies Research Network is an international group of academics studying the social and cultural implications of the selfie. Our membership includes teachers, students, visual artists, reporters, and others from around the globe. Our projects include publications, conference panels, gallery installations, and teaching resources regarding the politics and aesthetics of selfie culture. Our primary project is a five-week class (including syllabus and teaching exercises) for university students studying selfies. In September and October 2014, we ran the class online with a select group of international students. In June 2015, we are launching an additional set of teaching resources created in at the Selfies Pedagogy Workshop at IR15. Our group welcomes scholars from everywhere, speaking all languages. If you would like to help us translate materials from our group to languages other than English, please click "Contact Us" above, or join us for conversation at our Facebook site linked below. If you're taking our course or interested in teaching it, download the syllabi and related documents here. Want to talk selfies? We also have vibrant discussions on our Facebook group, which anyone is free to Join. Read some of what we've written about selfies so far, find bibliographies about selfies, and other fun stuff.